Good evening everybody. 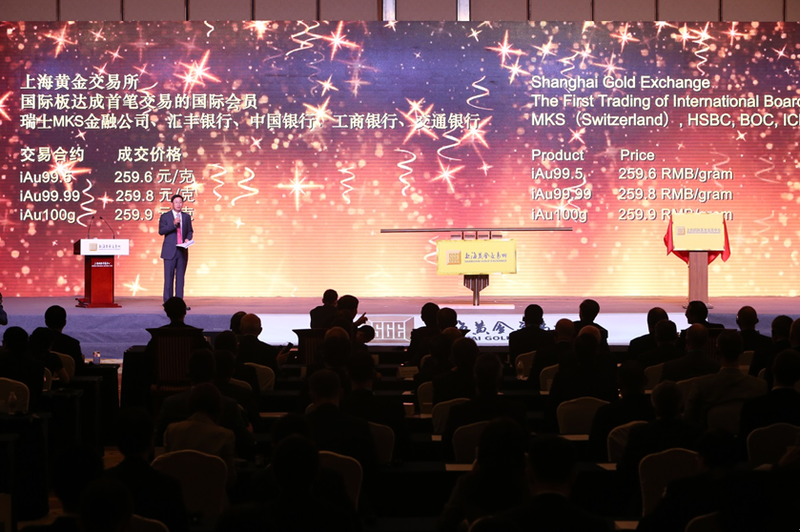 Tonight, we gather together here at the Shanhgai International Convention Center to witness this exciting moment – the launch of the International Board of the Shanghai Gold Exchange. Twelve years ago, when the Shanghai Gold Exchange was launched by the Huangpu River, it marked the starting of a new way of Chinese gold market. After 12 years of work, it has developed itself from a single-specie, small-volume exchange, to the world's largest spot gold exchange with multi-species, huge volume and investment functions. It has played a central role in the development of China’s gold market and has made a positive contribution to China's financial market system. We Chinese believe that a new circle starts after every twelve years. Twelve years later, once again by the Huangpu River, the International Board of the Shanghai Gold Exchange is launching, which is a new sign, it marks the opening of the Chinese gold market. This launch is a strategic choice of the Shanghai Gold Exchange with an aim to integrate into the global market and adapt to the global trends. Accompanying this launch, the Shanghai Gold Exchange will be able to realize four breakthroughs. First, internationalization of its membership. The exchange first absorbed 40 international members at this moment. These members include not only the most famous international commercial banks and institutional investors, but also leading gold refining companies. There will be more international members to join in the future. International members can independently participate in the exchange of all products, and also carry out brokerage business for international investors. International investors include the registered investors at the Shanghai Free Trade Zone, and also the overseas investors. Second, internationalization of its trading capital. The International Board will introduce offshore funds, both from the Shanghai Free Trade Zone and from abroad, into the transactions. They can be both offshore RMB, and offshore convertible currency. These funds will be involved in the framework of free trade accounts in the trading of gold and other precious metals quoted with RMB. Third, internationalization of its pricing. 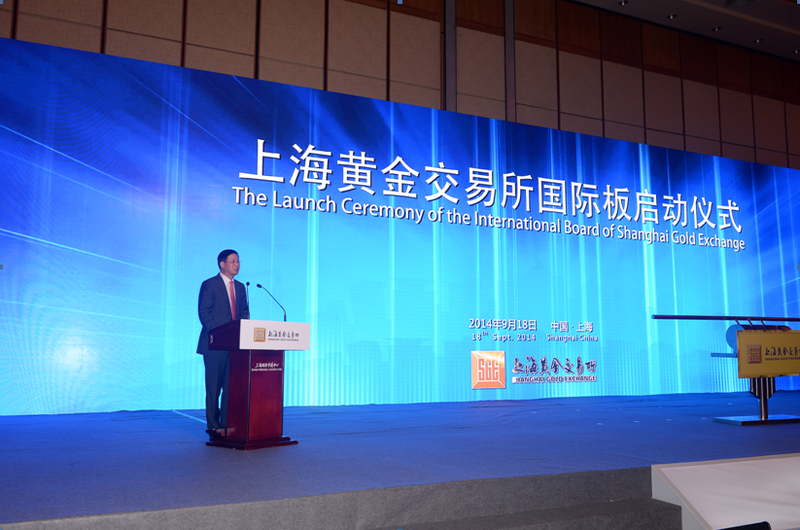 As a RMB-denominated exchange, with broader participants, larger trading volume, and with the sound integration of onshore and offshore investors and funds, the trading pricing of this Exchange will be promoted gradually to its internationalization, and eventually build a RMB-denominated gold price benchmark with big international influence. We call this pricing mechanism and its corresponding products and physical delivery standard "Shanghai gold". The introduction of the "Shanghai gold" in the gold market will help to improve the price discovery function of the RMB, strengthen the effective linkage between Chinese and international markets, and effectively exert the due role of China in the international market as a number one physical gold consumer, producer, importer. It will also help to enhance the international influence of RMB and boost its internationalization. Fourth, internationalization of its storage and delivery. With the launch of the International Board, our customers may choose to deliver physical gold at the Free Trade Zone vaults of the Exchange, since the Free Trade Zone has an "open line" policy, which allows the Exchange to entrust qualified institutions to import the physical gold into the territory, and freely re-export to the rest of the world. This will provide the Asia-Pacific investors with more convenient and efficient re-export services, and make Shanghai a gold re-export center in the Asia Pacific. To this end, three gold products transacted within the Free Trade Zone are introduced, with a trading unit of 100 g and 1 kg of iAu100 and iAu99.99 with a fineness of 99.99%, and a trading unit 12.5 kg, of iAu99.5 with a fineness of 99.5%, respectively. We have set up a modern gold vault with a capacity of kiloton in the Free Trade Zone, to offers a range of delivery, warehousing, logistics and other support services for the import and re-export of gold. Today, the official launch of the International Board has put us on a new historical starting point. Carrying the golden dream of the Chinese people, we will uphold the concepts of innovative development, opening-up and win-win, in our enduring efforts of producing innovative products, improving service and making the Exchange a platform with greater international influence, and ultimately, making due contributions to the construction of Shanghai International Financial Center, to the development of China's gold market, and to the prosperity in the world gold market.